Origins Game Fair 2013 is behind us. I had a blast this year and heard a great deal of positive comments. For the first time in a long time I actually stood in line to get my day pass. The dealer hall was abuzz all day Saturday (I can’t comment on the other days) and there were many booths where getting a demo in was quite difficult. This was also the first show I’ve had my family with me and it was an excellent experience for us. The hall was a bit overwhelming for my daughters at first, but they quickly warmed up when they sat down to a game of Duck! Duck! Go!. They spent a large portion of the day in the Mayfair Family Center which freed me up to do a great deal of networking and pitching. Having them there for respite and encouraging hugs was an excellent addition to the nerve-wracking grind of pitching to publishers. And boy did I pitch to publishers. I spent so much time talking to publishers I had very little time to do much else. I ran into Corey Young as I was standing in line and we chatted briefly. Later, Jason Tagmire showed up at lunch. It was great to bump into some familiar faces. I ran into Chris Zinsli (one half of Cardboard Edison) and together with Eric Leath we flagged down Jay Treat to teach us Time and Space from Stronghold Games. This was the one and only game I played the entire day. I did pick up a few things. 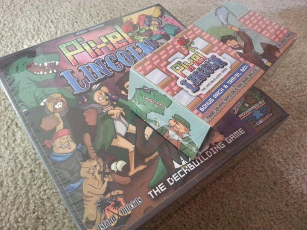 I was able to get my copy of Pixel Lincoln, which was awesome. Origins 2012 was when I was introduced to Jason Tagmire and the quirky little universe he created and I backed the game as soon as I could. 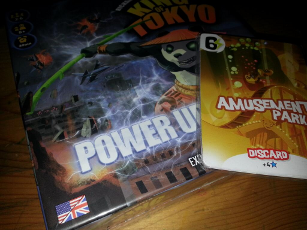 I also snagged up a copy of the King of Tokyo expansion, Power Up, while I could. I didn’t know that there were promos and was glad that the guy at the booth hooked me up with a set. Throughout the day, I met with five different publishers. Some of these meetings were semi-formal affairs where I scheduled a time and others were more free-form or even on-the-spot. I’m not going to mention any names here for the sake of professionalism. If you find yourself in this position in the future, I suggest you do the same. If you do want to write about a specific experience with a publisher, please ask them if that is okay first. It is simply the right thing to do. My first meeting of the day was one of the scheduled meetings. This was with a smaller company that makes some awesome products. I’m not positive it is a one-man-show, but it very well could be. Regardless, I’d be thrilled to be published by them as I really respect their products and professionalism. The meeting was specifically to show Black Bear Downs. When I set up the meeting, I gave the publisher a brief overview of some of my games and this is the one he asked to see. I didn’t want to waste his time, so I didn’t even ask about the others once I got in front of him. The pitch went well and he asked me to submit it for consideration, which I am in the process of doing now. What became evident throughout the day was that this game is going to be difficult. There is already a whole host of clear winners in the racing/betting genre and to compete with that, I need to make sure my game brings something special. After the pitch, I asked if I could get his opinion on something, and I brought out Hedeby. I didn’t tell him about Hedeby previously because… well… I didn’t think it would be ready. It came together in the last few weeks. I wanted to show it to him because he is a smaller publisher and I needed to know what he thought of the viability of marketing this game. This wasn’t a pitch, this was a very brief introduction to the game. His concerns reflected my own in a small market: a game consisting of 120 cards is fine, but when you add in 10 custom dice, it is suddenly priced out of the market for smaller publishers. He told me that those 10 dice would nearly double the retail price which just wouldn’t be feasible for him. That info was great going forward and is something we all must consider. Don’t price your game out of the market with tons of cool components. My next scheduled meeting wasn’t until the evening so I spent most of the day drifting. I met some wonderful new people and soft-pitched a few games to publishers with promises that I’d show them something at GenCon. What I mean is, I didn’t really show them a game, I just discussed projects I’m working on to see if there was any interest. That was a cool process. I really enjoyed the relaxed feeling that those sorts of discussions brought. I was intensely nervous at the first pitch session because I find it difficult to talk myself up. Having a more free-form conversation meant that I could relax and just be myself meant that I could present my ideas without fumbling for words. I am going to work on that process more. It was nice. Then came my last meeting of the day. If you follow me on Twitter, this is what you came here for. I may have been a bit ecstatic on Twitter Saturday night. I apologize for the flurry of cryptic tweets. My last meeting was with my dream publisher. This publisher is a large group with a very long and illustrious track record. I have dreamed of being published by them since the day I started designing games. A chance meeting elsewhere led to this pitch session and it was the most amazing session I’ve had, ever. First of all, the person I met with has made a career out of scouting games. He is a very warm individual and a perfectly engaging listener. He quickly took control of the session and removed all of my tension and nervousness. I started by showing him Leathernecks ’43 and misjudged his silence as indifference. I tried to shuffle the game aside a little too soon and he encouraged me to continue. I walked him through a sample turn and he commented that he liked how balancing the press-your-luck versus keeping up with your opponents in three different categories played out. We talked a bit about the design process and why I made certain decisions and that really felt good. He could have completely hated the game for all I know but he was professional enough to engage with me about it. The biggest issue I have with this game, and he confirmed my suspicion, is that I am using 7 dice of 4 different designs. That’s a pricey decision that makes this game difficult to bring to fruition. Next up was Black Bear Downs. He immediately told me that the game was a difficult sell because the racing and betting genre already has a clear winner, Royal Turf, but he encouraged me to pitch anyway and gave some awesome insight. 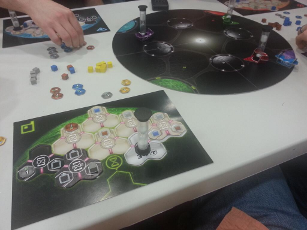 He used words to compare me to Knizia like “clever” and that felt amazing. The thing he asked for was something to separate it from all those other racing games. His suggestion? Make it goofy. Make it actually about black bear racing and maybe you can have the bears leaving the track to maul spectators or attack each other or something. This is miles from my goal with this game, but I appreciate it and I see where he’s coming from. I might work on some of those ideas we shared! Last up, Hedeby. Now, before I get into this I want to set up the scene: I pride myself on my ability to read people. I am generally exceptional at detecting micro-expressions and body language and using that information to help me through social interactions. Through the first two games, this guy was giving me nothing. He was stone cold. A very warm individual with great demeanor. We chuckled and shared some moments… but that was all superficial. He showed me absolutely zero “tells” as poker players would call them. I pulled out Hedeby and started going through the play. I showed him the different cards, how the dice worked, and how you pay for things. I showed him how you could build your engine to focus on various paths and how the game helped you tune your rolls as it progressed. I went through a sample turn and eventually, I stopped trying. I just stopped talking. I was defeated. I’d just spent a half hour with this man, showing him my three favorite designs, and I couldn’t read a damn emotion off of him. Just blank. He sat up straight and leaned back in his chair. It was like someone flipped a switch. I could tell that he was trying to hide his excitement. I felt my face flush and my pulse accelerate rapidly. After some awkward silence he said to me, “in this case, my silence is not a bad thing,” with a slight smirk. “I know,” was my only response. I literally couldn’t talk because I just saw this guy go from a stone-cold professional to a playful kid being shown a shiny new toy. I was dumbstruck. We started talking about the balance. We discussed how it could be tweaked here or there or new mechanics could be introduced. We talked about how the game has static states that hold from turn to turn so that you aren’t screwed by the dice. I felt like, for the first time in my life, this publisher really wanted to work with me on a design. He saw the entire game “engine” and not just the cards in front of him. I know that the success or failure of this game with this company isn’t going to hinge on slight imbalances or imperfect cards. He saw the whole picture… and the potential… of the entire game. Now, keep in mind… this person, he’s a scout. He still has to present the idea to the rest of the company… but, his job is to scout. I’m trying not to get my hopes up, but it’s difficult! After we wrapped up, he told me he’d like for me to forward him some info on Leathernecks so he wouldn’t forget it. He wants to talk it over with the others first. Then, he begged me to leave Hedeby with him. He told me up-front that he wouldn’t’ have time to play the game before GenCon because of his busy schedule, but he wanted it in his hands. He wanted it on his shelf and he wanted to become familiar with the game before he presented it to the rest of the company. So, I enthusiastically handed off my one and only copy of the game to him. I left Columbus, OH without the 10 custom, laser-etched dice I ordered only a few weeks prior. I now have no way of playing the game myself! 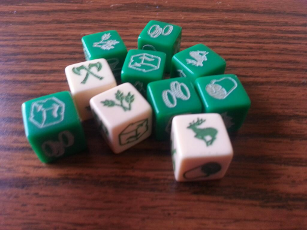 I guess it’s time to put it together on thegamecrafter.com so I can have my own set with stickered dice. Regardless of what comes from my pitching this year, this may just be my new favorite Origins. My family was along for the ride, I got to meet up with some fabulous friends, and I got to get my hopes up with some very enthusiastic publishers. Next year, I think I’ll stay for a few more days.